It's more than a year old, but there's loads of fun to be had in GTA 5's multiplayer mode. It's been a year and three months since Rockstar launched GTA Online, an ambitious multiplayer project that turns Los Santos into a playground for gangsters and professional thieves. We reassembled our crack heist crew, loaded up on weapons and launched into an online crime spree to see what's new, what works, and what doesn't. Samuel Roberts: I’ve not followed GTA Online closely enough to know exactly what’s appeared at what time. What I do know is, head into Los Santos now, and it’s utterly rammed with stuff—essentially an MMO you don’t need to pay a subscription for. There are races, story missions, the chance to earn extra money and experience working for a CEO (or being a CEO), brilliant vehicle theft missions and tons more. You’ve even got the four-player heists, which are kind of like GTA’s version of raids. I love it, and for those who miss the Episodes From Liberty City-style single-player expansions, the quality of the missions here feel like they fill that gap to some extent. Phil Savage: The missions are (mostly) great. I've been working through Lamar's stuff, added in last year's Lowrider DLC, and it's full of fun, interesting objectives and scenarios. It's a shame there isn't the same sense of progression elsewhere in GTA Online's missions. It's also nice to see the open world padded out with more stuff to do. 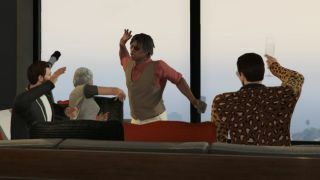 At launch, GTA Online's freeroam felt formless—a lavish, chaotic city filled with not that much to do. It's slightly better now, with challenges, events, and missions triggered by the player-CEOs of the new business system. Despite this, many of GTA Online's issues remain. Most notably, the infrastructure is a confusing mess. There are (at least) three ways to launch a job, and multiple different ways to invite friends. And, of course, there are modders. For all Rockstar's warnings about taking mods online, it hasn't stopped people. My first experience of a Premium Race—the new, high-stakes race mode added as part of the Cunning Stunts (sigh) update—was ruined by a car teleporting about the map. Over a year after the PC release, and it's still clearly a problem. I'll continue to put up with, though, if just because GTA works so well with friends. A few people on a private server can be riotous fun, and missions and heists keep generating stories of camaraderie and hijinks. More than that, they create interesting power dynamics that tell a story as you play. How do you respond to your friend's role as CEO, or the fact that someone has to pay upfront to trigger a heist, or that the mission failed screen always let's you know who's to blame? It's well tuned to create an interesting balance of competition and cooperation, and that only helps generate more interesting and surprising anecdotes. After all, it's a special kind of multiplayer game that makes it fun to be a passenger. Tom Senior: The ability to start a company and hire your pals to work for it is a nice touch, giving players a more exciting way to make money than repeating heists. Your suave business offices are the funniest thing Rockstar has made in ages. There’s a receptionist who will feed the CEO endless chocolate bars. Your (hopefully dumb) business name is on the wall behind the front desk. In the back there’s a boardroom with a huge table, with a map of Los Santos carved into it. Only the CEO is allowed to sit at the head of the table, and when they do sit down, no matter what they’re actually carrying, they somehow pull a huge revolver out of their jacket and put it down on the table. As an employee you can press left and right to pretend to look interested in what your colleagues are saying. It’s a funnier take on the interactive bongs and whisky tumblers in player apartments. GTA Online’s small shared spaces give a group of mates a lot of little ways to create fun. The heists are still GTA Online’s best events, however. The missions have about a 50/50 hit rate for me. In tough sections some players may be attempting, failing and repeating a tricky objective while others drive around for ages in a bus. It’s a mammoth design task to give four players equally interesting entwined experiences, but forced repetition exacerbates the problem, especially when checkpoints fall before cutscenes or long empty drives. Stealth sections suffer from punishing insta-fail rules and a few set pieces, such as the prison breakout, rely on tediously long wave combat sections. It’s amazing when a heist comes together, however. You get to assault aircraft carriers, steal planes, shoot down helicopters and rob banks. The game offers you a huge bonus if you complete the heists with the same set of friends, which is by far the best way to do it if you decide to jump into GTA Online for the first time. The heists create genuine camaraderie and generate watercooler hero moments, whether it’s your pal shooting police choppers off your tail during a hairy takeoff, or a passenger managing to sticky bomb a tailing car by lobbing plastic explosives out of the shotgun window. Samuel: I came close to spending £12/$15 on a shark cash microtransaction the other day. I never spend money on those. That’s how they get ya. I almost paid real money to own a digital version of something I’ve almost certainly stolen in the single-player game. That’s how enticing this online universe has become to me. I can’t wait to see how Rockstar continues to build on it.